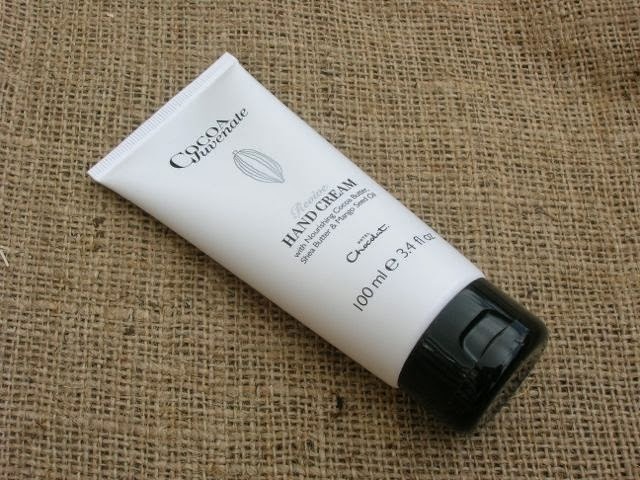 Chocolate comes in many forms and here it comes in the form of hand cream. Cocoa butter has long been used for cosmetic purposes. I have used it myself on occasion to make my own body butter and lip balm. Cocoa butter is said to have a number of benefits: it is high in fatty acids helping to keep skin hydrated, high in antioxidants known for fighting off free radicals which stress the skin and helps to reduce stretch marks and scar tissue. Hotel Chocolat now do a range of skin care products, Cocoa Juvenate – all using cocoa butter of course. In addition to the benefits already stated, they claim there is an extra feel good factor and that slapping it all over will enhance your mood as well as rejuvenate your skin. Great for chocoholics who can now have an all round chocolate body experience, both inside and outside; the skin is, after all, the biggest organ of the body. When I was offered a tube of Revive, the Cocoa Juvenate hand cream, I was very happy to try it out. Like many of us hard working food bloggers, I don’t pay as much attention to my hands as I should. They get very dry from frequent washing. This isn’t helped by my gardening activities; soil is notorious for drying out the skin. As well as cocoa butter, Revive contains shea butter, mango seed oil and honey, all good protective moisturising ingredients. The scent is pleasant, if a little strong for me and reminds me of bergamot. A little goes a long way and massaged into hands and cuticles, it is almost instantly absorbed, leaving hands smooth but not at all greasy. The hand cream came in a very smart paper handbag echoing the black and white packaging of the product, which itself has a silver cocoa bean printed both on the box and the tube. Available in store and online, a 100ml tube costs £19. With Mother’s Day fast approaching, this is a gift which will surely be appreciated. Mummy bloggers, multi taskers par excellence, deserve a little pampering from time to time. In that spirit, I’d like to pass the love on to one of them. Galina of Chez Maximka is a devoted mother and blogger. She is also a prolific cook and artist to boot. With two sons, one with autism, her life is very busy – I don’t know how she does it. May her hands be smooth, silky and fragrant. Thanks to Hotel Chocolat for the hand cream. There was no requirement to write a positive review and as always all opinions are my own. How delightful Choclette and how VERY suitable for a chocoholic like you! This looks rather lush. I have used their body wash and that was good too. oooh I had no idea that Hotel Chocolat did skincare. Love the sound of this. I didn’t know Hotel Chocolat now have a beauty range will have to see if they have any samples to try when I next pass their shop in Westfield. Oh that sounds lovely and no calories, brilliant! I bet it smells divine! This sounds amazing! I am not sure that I could stop smelling my hands though haha. Sounds like perfect hand cream! I love cocoa butter in all forms, and my hands are so horribly dry at the moment I may well treat myself to a tube of this. Thanks for sharing Choclette! And I am sure this cream is good! I love cocoa butter creams. Nice review Choclette! Oh wow, I never noticed they did this. I bet it’s gorgeous! I saw this when I went to salon du chocolat they are really nice products. Hotel Chocolat seem to be branching out. Calorie free chocolate, even in handcream format is always welcome! I got to try this at one of their press shows, and am super jealous of your samples. I try to keep hand cream on my desk, but the current bottle has been there for years so I have to use it more. Oh I love cocoa butter, and this sounds a gorgeous product. What a great idea of Hotel Chocolat to branch out!. I don’t use hand cream anywhere near as often as I should, make that virtually never. Must address. Love this product, goggled it, found it but unable to buy it with any of my American credit or debit cards. Where can I get it in WNY? Hi Sally. Oh what a pain. I’ve had a look at the Hotel Chocolat online shop and they do ship to the US, so I’m surprised you can’t use your credit cards. I’m afraid I don’t know of anywhere else you can get them. I don’t think they have any shops in the US. Maybe a good excuse for a trip to the UK?